With everything ready for the frog to be installed, it’s time to start adjusting to some final dimensions. First thing is body depth. 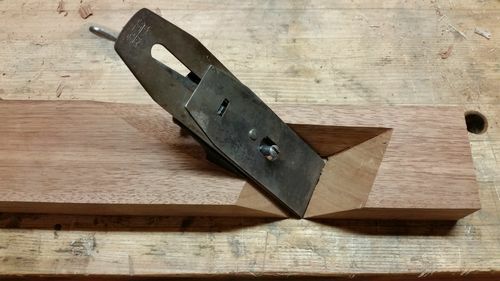 If your blank started at 1-3/4, you should be close to the correct depth, as most transitional bodies are 1-1/2 thick and there is about 1/4in of cast iron frame on top of that. Here’s the best way I’ve found check thickness. Adjust the depth adjuster knob to about 1/2 way from front to back and set the frog on the body. With the iron and cap iron locked together, set it on the frog and check to see where the leading edge of the iron is. Do NOT attach the frog. If there is a depth problem, the fix could cause the holes to be in the wrong location. You do not want to use the lever cap, as any tension there will throw off everything setting flat. Go ahead and use the depth adjustment and see if the iron will be able to extend through the mouth. The iron and especially the cap iron may not actually fit through the mouth at this point. That’s OK. All you need to do is be able to check that the leading edge will be able to extend far enough. If the body depth is fine, skip the next part. If it is too thick, you have a decision to make. The only possibilities, of course, are to remove stock from the top or the bottom. Both have pros and cons and I advise reading through both before determining a course of action. First choice is removing stock from the bottom. 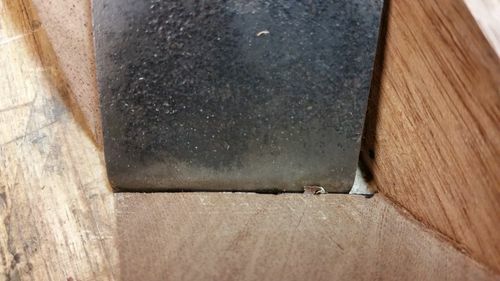 This probably seems the easier route, but will open up the mouth and cause you to have to go back and readjust everything from the width of the channel that has been cut to the location of the frog. That said, if you only need to remove 1/16 or so, it might be the better route. Second choice is removing stock from the top. This will mean redoing some the work of chiseling out the notch for the bump out in the frog and the channel for the depth adjuster, but everything else will remain the same. If needing to remove very much, this is probably the better route. 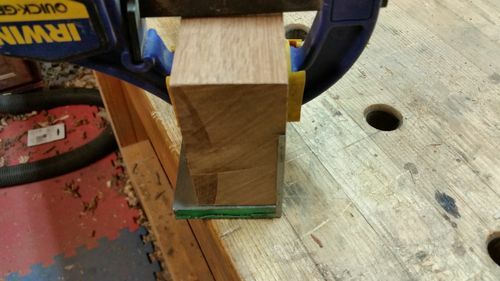 It seems like extra work, but I’ve never figured out a really accurate way to find the correct thickness before cutting into the blank, other than doing all the work on a piece of scrap. I tried on the first two and ended up with one blank a little too thick and one that had to be scrapped because it was too thin and I felt shimming up the frog would look silly. Thinking it through, this was the best I came up with and it worked well for this build. Once again, if someone comes up with a better method, feel free to share. Once you have the correct thickness, we can start working on the infill look. 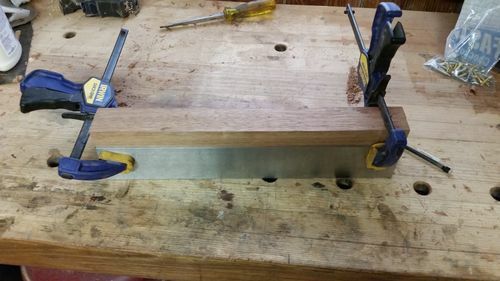 Let me pause here to say that if you don’t want to do the metal work, here is where you could just leave the wood blank as you’ve got it, glue on a wooden base plate, flatten, shape and use it that way. You would lose all the advantages that the steel brings (mass and wear resistance being the biggest two) but would have a usable shooting plane with a lot less work. Part of the design of this plane involves getting a bit of an overstuffed look. It gives a really clean look and gets rid of some possible sharp edges. This means insetting the 1/8 thick piece of steel into the body. Set the 3/8 piece of steel on the bench, the wood body on top of that and the 1/8 piece on the side. Clamp the body to the 1/8 piece. With this done, mark on the wood the line that is the top of the steel. Pull the steel and check to see where the line hits in relationship to the mouth. Ideally, they should be approximately even. If not, now is the time to make any adjustments and remark the line. If the mouth extends past the width of metal you have, it’s really not an issue. Now you’ll need to remove the wood in that area to a depth of 1/8 or just over. (I’d pick just over. 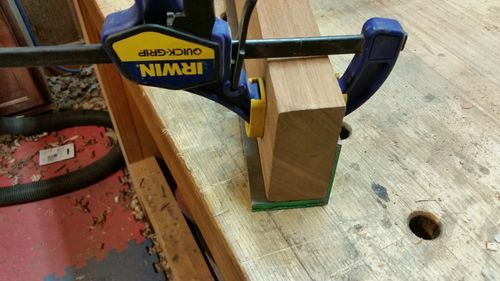 It’s easier to remove a bit of wood to get them even later than a lot of metal) Do it however is comfortable—table saw, rabbeting plane (such as a #78) or router. I used a router table. Next installment: Time to start some metal work.